Note: You can enter this giveaway one (1) time per e-mail address per day. Deadline is 11:59PM ET 8.18.18. 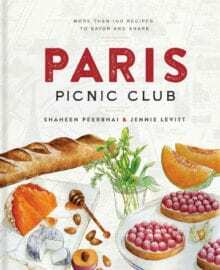 A picnic club sounds absolutely delightful and a Paris picnic club, well, absolutely divine. Spread out some blankets, drape a cloth over your outdoor table, gather your favorite people and delight in the joy of sharing a meal. How about a lovely Tarragon Aioli or Basil Pesto to zing up to your sandwiches or simply delight your companions and slice into Roast Beef with Rosemary Peppercorn Crust and Horseradish Jus? Every picnic requires a happy dessert, so make these wonderfully versatile and scrumptious Hand Pies, they are sure to induce a smile. NO PURCHASE NECESSARY TO ENTER OR WIN. Void where prohibited by law. Open to legal residents of the 50 U.S., D.C. and Canada (excluding Quebec) who are at least eighteen years old at the time of entry and have internet access. Begins on 7.28.18 at 12:00:00 a.m. ET and ends on 8.18.18 at 11:59:59 p.m. ET. To enter this giveaway, submit your full name and email address on this form. Odds of winning this giveaway depend on the total number of eligible entries received. Only one (1) entry per email address per day. Sponsored by Leite’s Culinaria, Inc. For more information, visit our Official Rules. For a list of winners, check out our Very Happy Winners page. Be sure to add giveaways@leitesculinaria.com to ensure notification if you are the winner.